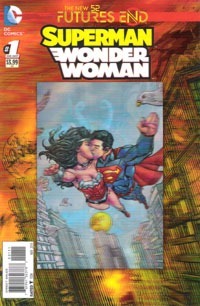 This issue caught me a bit by surprise, as apparently it’s the 2nd of a 2-parter, continued from the Wonder Woman issue. Not what I expected, and not something I was thrilled with, but hey…it is what it is. I read it anyway, even though I might’ve waited to track the first chapter down. But I wasn’t in the mood for that game, and since I feel like I’m always going on about how it isn’t horrible to “figure things out” in context, no reason not to put that to the test. Sure enough, I was able to figure out quite a bit just by reading alone…it helped that the nature of these stories is that there’s been a time gap anyway, so I’m already mentally wired for not having “the full story.” That said, this was one of the better issues in terms of story and felt like it really could have been setting things up for a new status quo in the ongoing if this wasn’t just a five-years-later deal. As I’m already following Soule’s run on this book anyway, it’s good–to me–to have this issue in there as well. 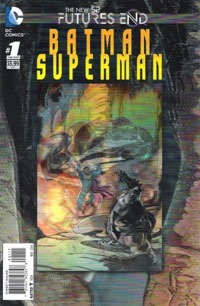 I expected an actual fight between Superman and Batman in this issue. 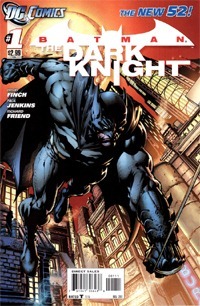 What I got instead was a Batman-centric story, where the confrontation happened sometime in the five-year-gap and left Batman in bad shape for where this issue picks up. Not following the ongoing series, I don’t know where this fits…whether it’s dropping any hints or particularly drawing from that. This issue also felt rather familiar in terms of Batman suiting up against Alfred’s advisement and putting himself in a situation where his body’s ready to fail him and he’s doing irreparable damage to himself, etc. I picked this one up on a whim…I had not planned ahead of time to get it, and it unfortunately proved more disappointment than not: I should have left this one on the shelf. 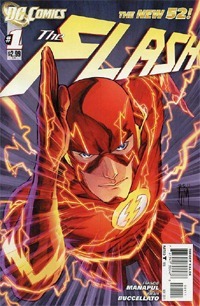 Of the various DC titles, this is the one that I’m probably most torn on. I liked stuff last year enough that I went backward several months on the title and kept up with it for several months after, though I did eventually let it go. 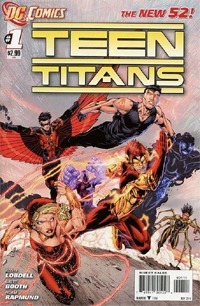 This issue plays off from last year’s introduction of the Cyborg Superman, bringing us a Kara who is now herself a cyborg…though it quickly becomes apparent that the Cyborg exerted a certain amount of influence over her that takes old friends to bypass and get her back into her right mind. While certainly not an “ending” story, this one definitely felt like–if not the start of a new chapter–certainly the ending of one. There are plenty of questions about what happened in the Five Year Gap, and I’m all the more interested in Kara’s story simply for the various places her story can go, and hoping that it would never turn out like this. I’m also left quite curious about her relationship with other characters, particularly Captain Comet and whether that’s just a possible development or if it’s been dealt with in the Red Daughter of Krypton arc or such. 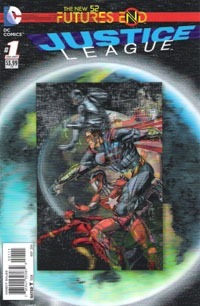 This is the concluding/second chapter of the two-parter begun in Justice League United. 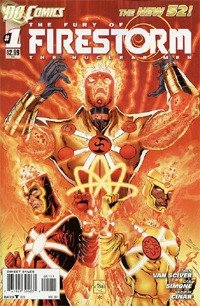 On the whole it’s this massive battle between the heroes and former hero Captain Atom, who is determined to break free of Mars no matter the cost–to the heroes, to himself, to the planet itself. And of course, the heroes have to gang up to stop him, while also dealing with the other freed villains. While in some ways the cost to the characters is higher than it might be in a regular ongoing story, it doesn’t feel all that permanent. More like the end of an arc leading to a new creative team and/or new status quo on one or more books. All in all the issue isn’t particularly memorable for me except in seeing Captain Atom play Dr. Manhattan on Mars (the latter actually based on the former). I got my 2nd chapter of 2 that I intended, though on the whole nothing particularly special to this for me. I don’t know much about this Heretic character nor do I much care. I was expecting something more Damian-centric, be it memorial or I don’t know what. Instead this is just some teaser issue with a possible future-Robin, who (from this issue alone) I know nothing about and haven’t a clue why I need to care (nor how Batman’s gotten along this long in his apparent condition over Damian…which is not to suggest anyone should merely “get over” such a hurt or loss just because it’s been 5 years. That the focus of the issue is Batman’s pursuit of the true identity of this Heretic, that he does indeed get his DNA sample…it’s infuriating to me (as this is a one-shot) that we as readers do not get let in on whatever the truth is…and this made me feel like the issue was a waste. Apparently I expected at least some sort of cliffhanger-like ending stating who the Heretic was…or even was NOT. If this were a continuing issue, I’d be totally fine with what I got as it’d be likely to pick up next issue. 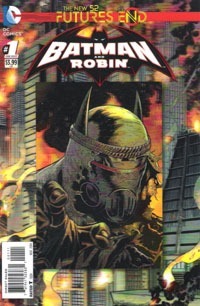 As-is…I’m directed into the Robin Rises stuff, and I’m not going there in single issues. 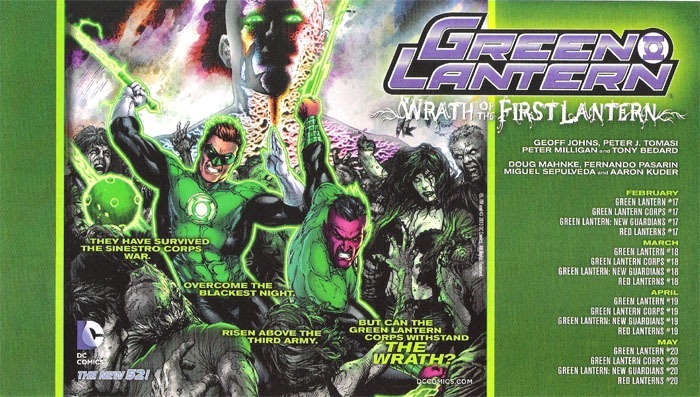 I grew up with Kyle Rayner as Green Lantern. 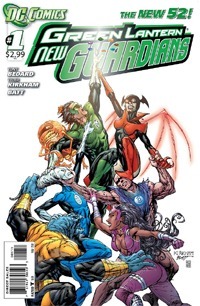 I get that I’ve hardly read anything with the character in years, and don’t know much about the status quo of the character for the last 30 or so issues’ time (and several GL crossover/”house events”). 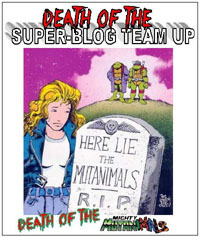 But from solicitation text and the cover, I sure expected more Kyle than I got. 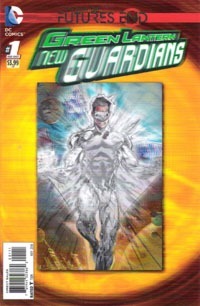 This was another passing-of-the-torch sort of issue, though I’m actually only GUESSING that this White Lantern was Kyle, based on the cover: nothing in the issue itself that I noticed confirmed or pointed out that this was Kyle, and at one point some name-dropping made me actually think perhaps this was Hal. Along with Batman and Robin this was definitely–for me–a stinker of a book and one I really would have been better off not getting. This is also the only one of the books this month with these 3D covers where the logo was given the treatment rather than just the image the logo and such is placed upon. Outside of the Supergirl issue, this week was pretty much a stinker for me, despite being one of the higher ones in terms of my expectation and such. 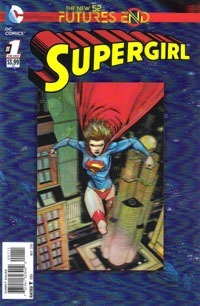 Supergirl was definitely my favorite of the bunch, both the cover itself as well as the story. 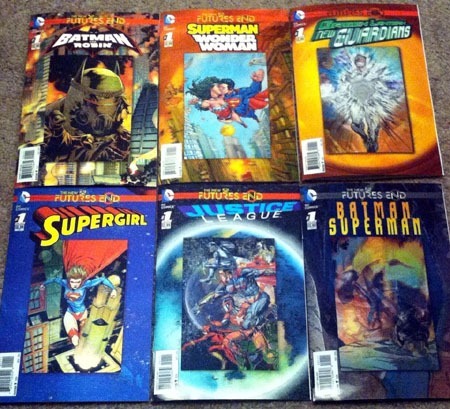 It may have been a circular logic sort of thing, but I didn’t even get around to reading these for a few days…and it was really only the Supergirl issue that pulled at me…the others I mostly read this week because I didn’t want to have NOT read them before the week four books would be out. 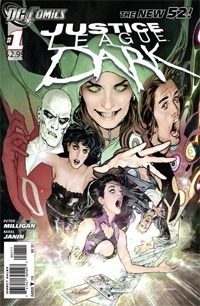 Some of this is probably also blame to be lain at the feet of the price, and sticker shock this month, as virtually every one of these DC books has been a $3.99 book I would not normally get…and is on top of a bunch of other stuff, both regular and new. Another monstrous week price-wise…outside of Batman Eternal and the $1 reprint/special edition of Gotham Central #1 (perfectly timed for Monday’s premiere of Gotham) (and the freebie Banned Books Week guide), everything was that price point I so despise…but at least they were the spiffy 3-D covers that sucked me in again this year! And of course, perhaps conspicuously so, one might notice the absence again of anything from Marvel. Such a shame, especially considering how much I enjoyed the X-Men in the ’90s and certain parts of other stuff in the last 10-12 years. 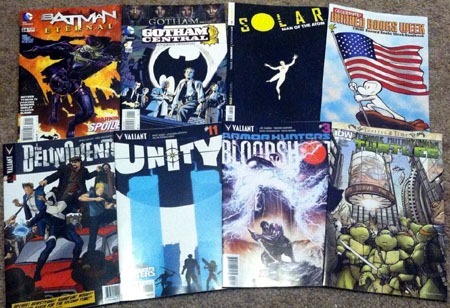 Definitely a good-looking crop of the DC 3-D books for Futures End this week. Might be the classic-looking yellow-and-red logo against the blue field, but I think that Supergirl cover is my favorite this week. I wasn’t going to pick up Batman/Superman…but figured it’s a one-shot, already spending a lot for the week, it’s Batman, and Superman…so I might as well add it to the pile. So here’s to a lot of interesting reading and the third of four weeks of getting fairly deeply re-acquainted with a bunch of DC output.